Rat Hunting with an M-1 Carbine!!! 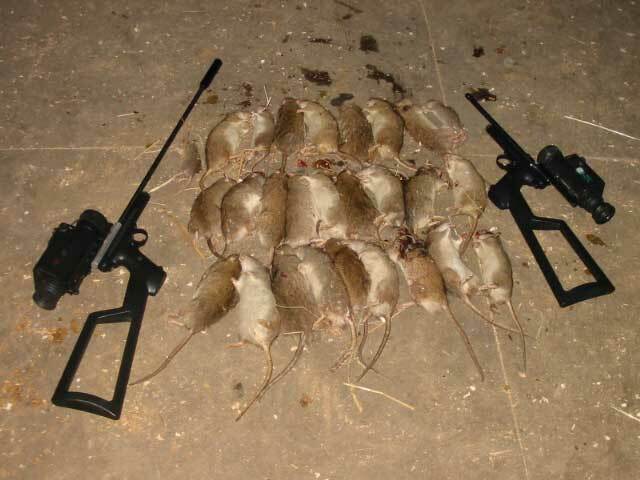 Rat Hunting with an M-1 Carbine ... and other stories! 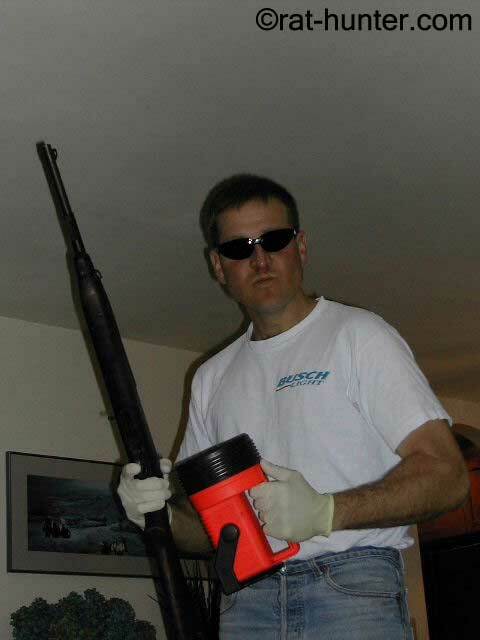 In 2003, my bro Kurt sent some Emails and pictures (scroll down) detailing how he used an M-1 Carbine to hunt a pesky rat. 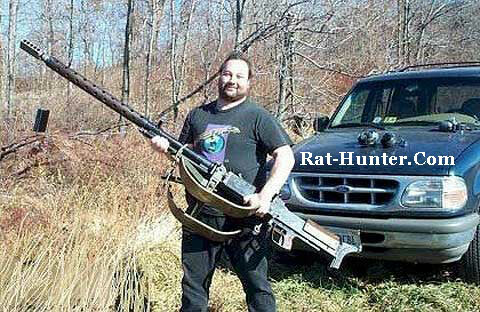 Subsequently, other rat hunters have sent in their own stories of hunting rats. Crank up your speakers as the audio (heh, heh! ;-) should work in most browsers as you move your mouse rat cursor around the screen - my favorite is the grenade launcher. Click on the guns to "vote" for your favorite rat story, send some rat email and add rat code to your web site. James uses both Traditional & Electronic Victor Traps! Dave's Rat Blowgun is deadly! Walda Cameron - Liberal Grandma with a Gun! 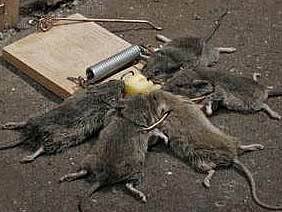 Rats versus Lawnmower - guess who wins? Squirrel Funnelator - with video goodness! 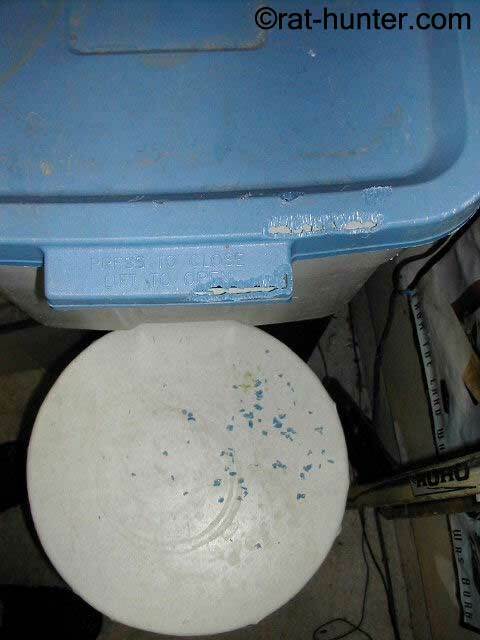 Paul's 2-for-1 Victor Rat Trap - Blue Light Special! Inspirational Posters - "Share Victory. Share Defeat"
He ends up using a electronic rat zapper! 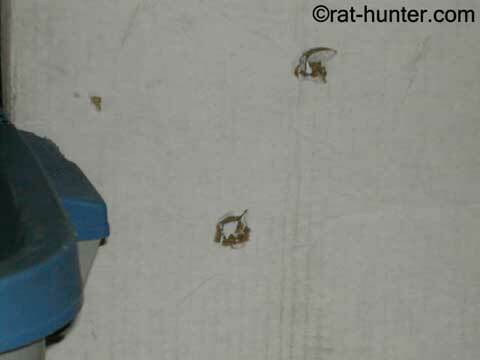 Stephen's Winchester 22 - seven shots, seven dead rats! 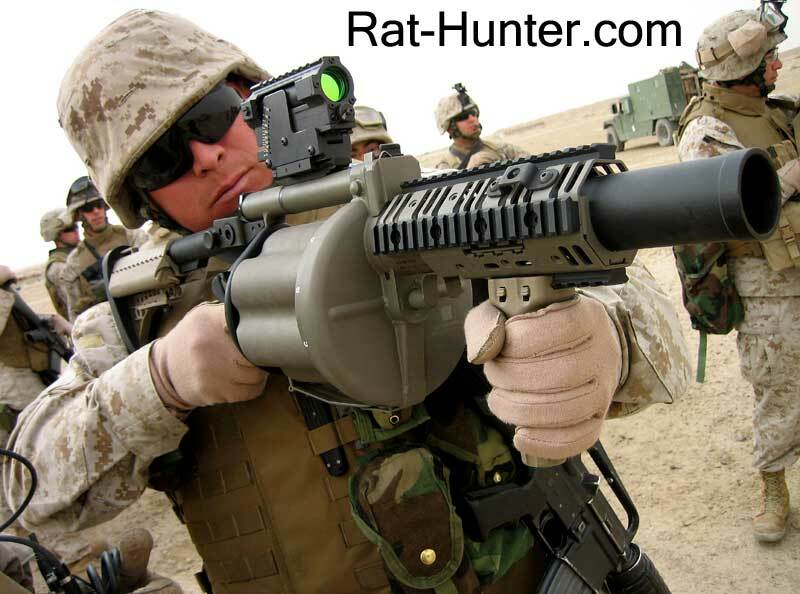 Fred's rat killing 6-shot grenade launcher - Holy Moley! Marvin in the Army writes about desert rats in Iraq - insightful! Margie takes out a buncha rats with her Daisy BB gun! KurtS mortally wounds a rat with his 44 caliber black powder pistol and then, armed only with a CO2 BB gun and low on ammo, bravely battles a beserko rat. Juna takes out rats by the dozen ... with NAPALM! 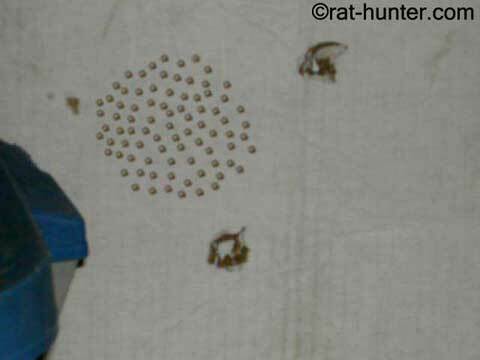 Jeff's Victor Rat Trap - 'ol Lucky #7 - does the job! We keep Macks dog food in the garage. The other day the bag had chew marks on it so I put it inside one of those plastic boxes. Pretty heavy tough plastic I might add. We have a very persistent friend. After seing the chew marks on that plastic I knew it was time to bring in the heavy artillery - no wimpy mouse traps for this critter. I could have been a stunt double for Shwartzy in Terminator 3. I camped out on the top of the oldsmobile in the garage with the M-1 Carbine which holds a .30 calibar bullet and a clip with 10 bullets. I had my high powered dive light and went to sleep, ever so lightly. Here is a better picture of my shot angle at close range. 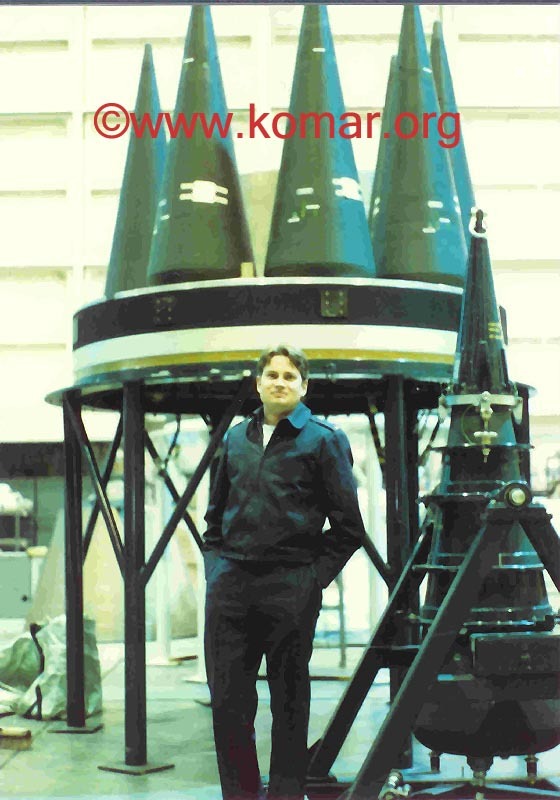 See the Blue plastic buckets on the lower right corner. Macks dog food is in there and somebody wanted in there bad ... but I was waiting with a loaded .30 calibar semi-automatic for my drive-in customer. It was not long before I awoke to the sound of my hungry dog food eating customer. I could hear him chewing on the blue plastic bucket again trying to get to Macks food. I had my dive light zeroed in on the blue bucket and the M-1 on top of that. I smoothly switched on the dive light with my left hand and lit up the kill zone. Surprise was on my side. He was on the bar stool on his hind legs chomping at the bucket. I touched off one round and it went high and right. The rat back-flipped on me as I fired off another round. He disappeared behind the shelves as Mary came steaming thru the garage door wondering what the hell was going on. Took two shots & only holes in the wall to show for it! Mary was not too happy with me taking potshots in the garage, but calmed down a bit after I showed her evidence of the rat - she hates rats about as much as Indiana Jones hates snakes. 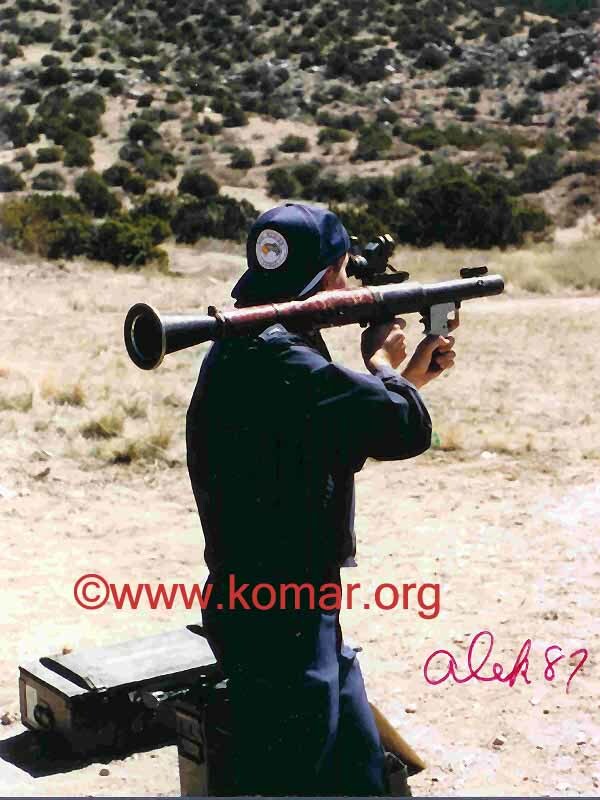 Since this was one agile rodent, I decided to bring in the really heavy artillery and grabbed my grandfather's 10 gauge shotgun, loaded both chambers, and camped out on the Oldsmobile that night. The shotgun will give me better spread although collateral garage damage could be more extensive. Mr. Rat didn't show up, so I figured I had scared him off ... but a few days later, I noticed fresh bite marks, so I grabbed my gear and laid in wait. It didn't take long this time - shortly after Midnight, I heard his canines scraping on the plastic. The dive light again lit up the kill zone, as Mr. Beady-Eyes stared into the barrel. As I pulled the trigger, he literally flew off the stool, and that split-second move saved his life ... this time! Took one shot and now a lot of holes in the wall to show for it! Mary shut down my gun-in-the-garage operation and made me go to more traditional means. Peanut butter/dog food mix on the mouse traps or rat trap. 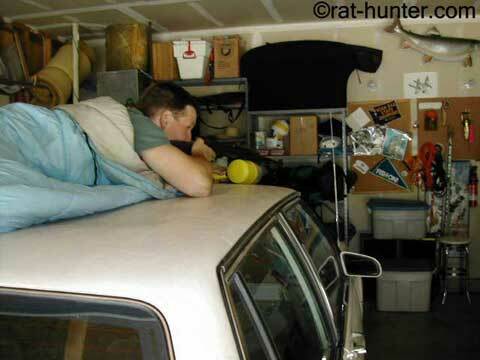 Put it in the crawl space and check it in the morning. Next morning I check the crawl space and the trap is licked clean and had been tripped but no customer. I pull the trap from the crawl space and 2 feet away lies my enemy. The Pentagon announces the formation of a new 500-man elite fighting unit called the United States Redneck Special Forces. These Alabama, Arkansas, Georgia, Kentucky, Mississippi, Missouri, Oklahoma, Tennessee and Texas boys stand ready to fight rats under the command of General Kurt. 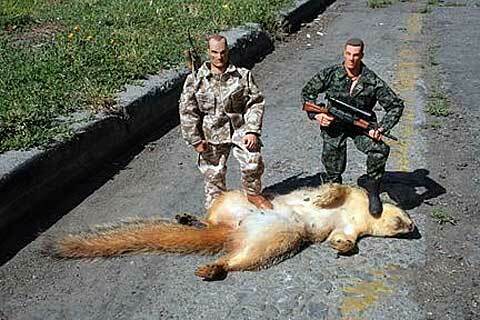 GI Joe answers the call to duty. Where did the bullets end up and weren't you worried about that? 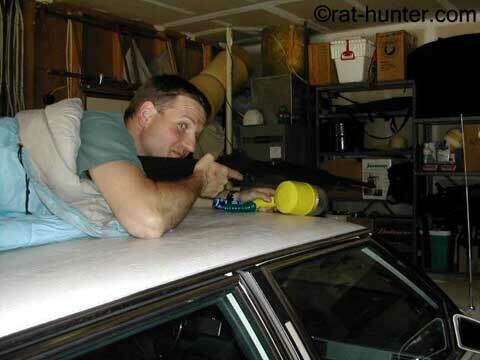 What did the neighbors think of the gun battle going on in your garage? Hey, this is Fall City White Trashville, not the Blue Heron Yuppie Homeowners Association. The brand name of the mousetrap and/or rat trap is perfect! 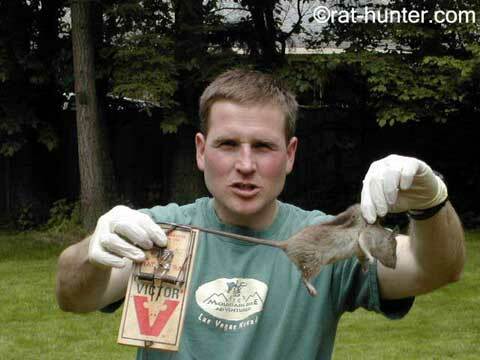 Yep, "Victor" is the same mouse trap that brother Alek used 6 years earlier when he was squirrel hunting. 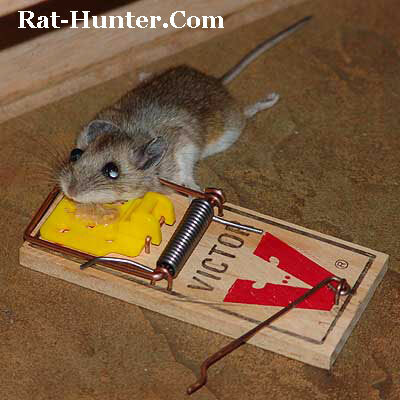 What was your next step if the Victor mouse trap didn't work? 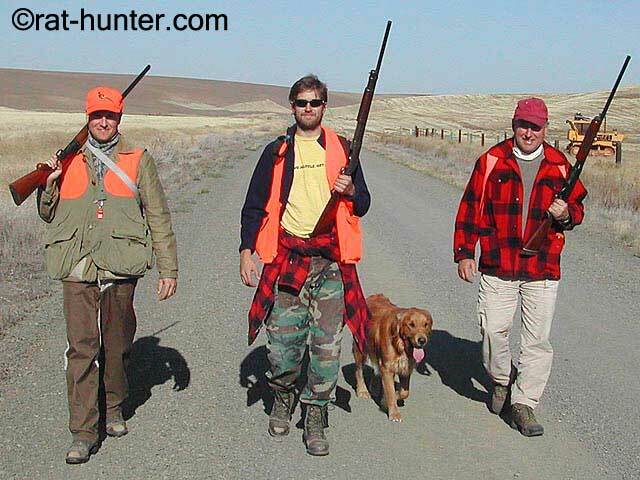 Call in the three shotgun dudes to take out this rat. If those guys couldn't do it, then consider a grenade launcher or an RPG ... and if that still doesn't work, then move to weapons of mass destruction! How did your friends find out about this? The Bob Rivers Show talked about it on 102.5 KZOK on Friday, June 13th, 2003 and they even replayed it again on August 26th, 2003. Listen to the DJ's talk about Kurt's saga for 13 minutes and then some listener's called in with their stories. Did you consider selling the rat on eBay? Nope - I gave 'em a proper burial. Emails and pictures will be published - plus read more here. Should I use an M-1 Carbine to take out rats or other vermin? 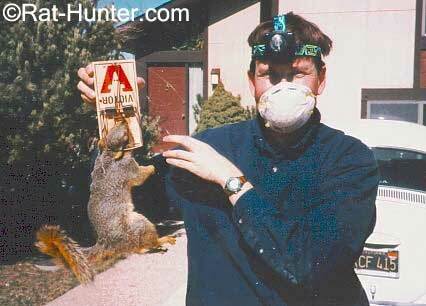 Kurt is a trained professional vermin hunter ... do NOT attempt this in your own home. A 78-year old grandmother tried using a 16-gauge shotgun against squirrels but ended up shooting herself - fortunately she ended up being OK ... but again, hunting vermin is serious business left to trained professionals such as the Fall City Rat Hunter! What would you have done if these had been water rats? I'd use either the Budweiser Airboat or my Navy Seal zodiac boat ... nuff said!